Added to my nightly salads: cherry tomatoes, cukes, kale, collards, chard, different colored snap beans, fresh oregano and, of course, fresh garlic. Picked the first batch of fresh Mizuna today - first time growing it. Had a great salad with Black Seeded Simpson lettuce, Red Russian Kale, Arugula, Mizuna, radishes, onion, and yellow cherry tomatoes. Served up with straightneck summer squash and stuffed bell pepper. 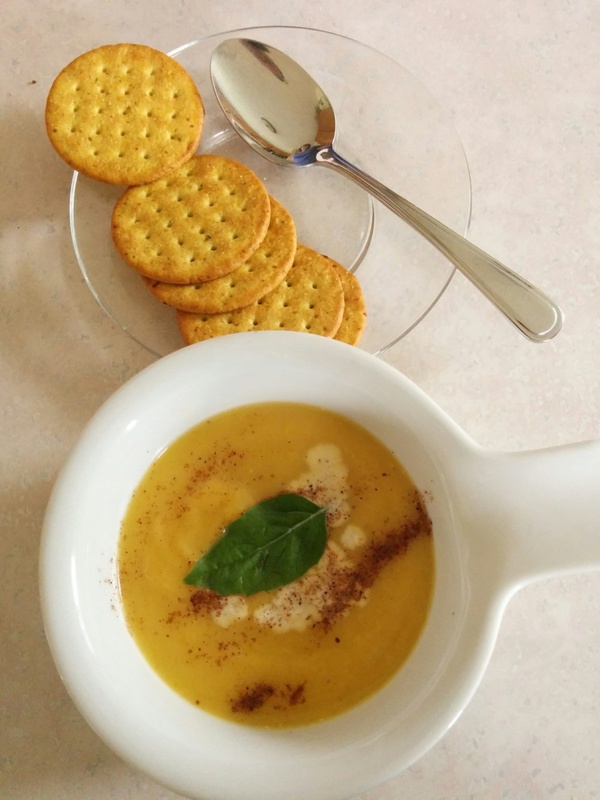 Turnips, in a soup with cinnamon and apples. Would make again, if/once I have more turnips. A Mediterranean spread that included a baba ganoush like dip from my Astrakom eggplants; tabouli with home-grown purslane, cucumber and cherry tomatoes; a red bell pepper; and cucumber slices. Earlier this week I made a meaty, pressure-cooker (aka fast instead of slow) version of Meghan Markle's Zucchini Bolognese sauce. I held back on the salt, and added a little tamari and fish sauce to kick up the umami, garnished with fresh tomato and grated cheese, served over radiatore pasta. I wasn't expecting much, but Wow. It was really hard to not eat the other generous serving right after the first. Thanks, Yolos, for the idea to grow Rattlesnake beans this hot, late summer. Tonight, soy beans from my single plant, a lilac bell and cucumber in the salad. I planted 2 spare pickling cucumbers in the east side strip with afternoon shade and they are in much better shape than the 16 planted in the sunny SFG bed. 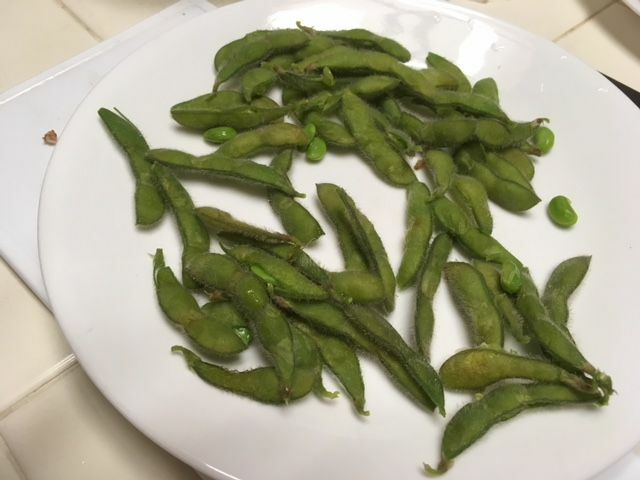 The single soy bean had to come out so I harvested any sizeable pods and microwaved them. I don't remember production this size from the soy I grew in 2014. ?? The Mel's Mix? It's August 23, and I finally picked my first full sized tomato! I've been getting cherry tomatoes for a while now, but not nearly as many as last year. Last year I had more tomatoes than I knew what to do with, and this year...sniff, sniff, I'm still having to buy tomatoes from the farm stand. And to add insult to injury, now I have to compete with the birds for the tomatoes!!! They're eating them off the vine. :pullinghair:It's just been a bad year for the garden around here, lots of rain and cloudy days. What's a tomato lover to do? My cucumber vine, the remaining one out of three, is big and healthy looking, but very few cucumbers. My pepper plants look healthy, but no peppers. Even the basil in the planter looks puny. Well, at least I'm keeping the local farmers happy by supporting them. If anyone has any hints for keeping the birds out of the tomatoes, I'd love to hear them. @hammock gal wrote: If anyone has any hints for keeping the birds out of the tomatoes, I'd love to hear them. Sorry to hear you're still not getting tomatoes - wish I could send you some since all of our neighbors are getting tired of the ones we keep giving away! 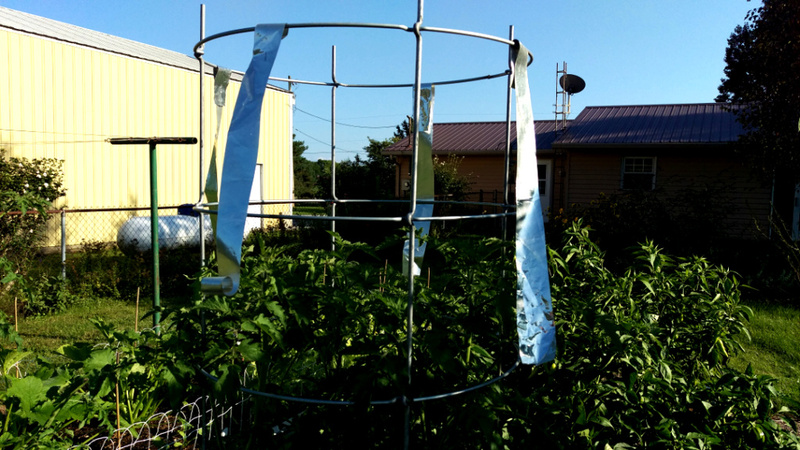 To keep the birds away from your tomatoes, suspend some Mylar strips from a pole or rack above them - they can't stand the fluttering of the shiny stuff in the wind, and won't go near it. That looks perfect...and cheap, actually free! I think I have a couple of mylar baloons I saved after they deflated, God knows why, but I thought they might come in handy for SOMEthing, and look at that, so they have. And I'm glad to hear that someone is getting loads of tomatoes. Please eat a bunch for me. @hammock gal wrote: That looks perfect...and cheap, actually free! I think I have a couple of mylar baloons I saved after they deflated, God knows why, but I thought they might come in handy for SOMEthing, and look at that, so they have. Those mylar strips in the picture I posted came from Starbucks coffee bags - Picked up a bag of coffee grounds from the local Starbucks, spread the grounds on the garden, washed out the bag and cut it into strips to hang up. Perfect partnership! Posted before I finished. Deleted. Yesterday a friend and I got together at my house to cook everything pumpkin. We had a bumper crop of Spookie Squash, a delightfully prolific pie pumpkin. We made 2 pumpkin rolls, 3 small loaves of pumpkin loaf, 2 dozen pumpkin oatmeal chocolate chip cookies, mini pumpkin whoopie pies, a pumpkin carrot cake, a vanilla pumpkin mousse pie, and a lemon pumpkin mousse pie. Our little granddaughter, 9 months old, had pureed pumpkin for her supper too while she sat on Grandma's lap. DorothyG, those pumpkin oatmeal chocolate chip cookies sound delicious! But then, anything Pumpkin is delicious. OG, they are good. They were the easiest to make too. My friend found the recipe somewhere online and it called for 2 packages of oatmeal cookie mix to start with. All the other recipes came from the Libby pumpkin site, verybestbaking dot com. @sanderson wrote: Tonight, soy beans from my single plant, a lilac bell and cucumber in the salad. I planted 2 spare pickling cucumbers in the east side strip with afternoon shade and they are in much better shape than the 16 planted in the sunny SFG bed. 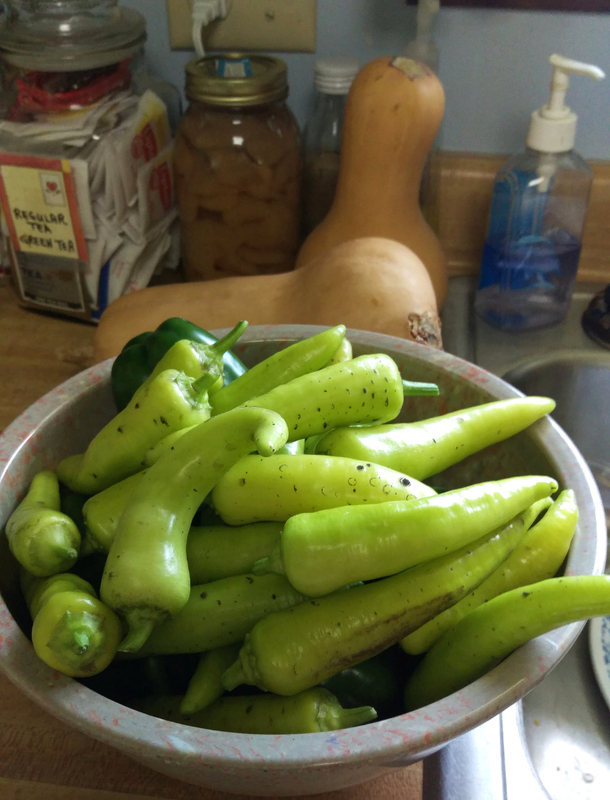 The single soy bean had to come out so I harvested any sizeable pods and microwaved them. I don't remember production this size from the soy I grew in 2014. ?? The Mel's Mix? I had a sautéed delicata, unknown other summer squash someone abandoned at work, garlic, a grocery onion, EVOO, s&p. Added in Simple Truth chicken sausage Gruyere and spinach,,, Pretty amazing, I must say. I think I see some stuffed banana peppers for dinner.... Love 'em! 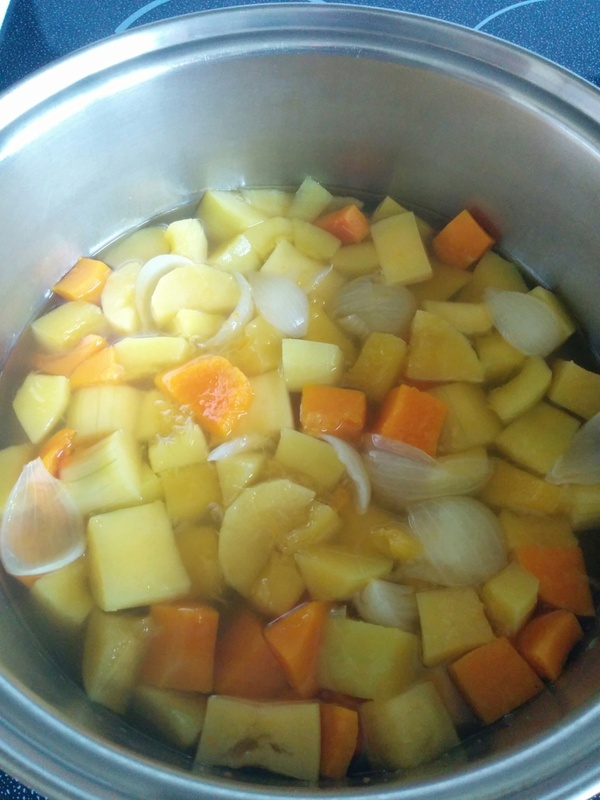 Currently making squash soup using a fully ripe butternut squash, a not so ripe Canada Crookneck and a yellow onion. All these from the SFG. When the veggies are cooked I'll use a hand blender to smooth them. Then I will add half and half cream, nutneg, salt and pepper before boiling the whole thing again. Update: Here is the final product. Looks great, OG & TD! I took a Brandywine tomato to work and many every body jealous at the cafeteria! Lol! I used SFG Kale and Cucumber in my green smoothie today. I also used the Vitamix to puree cucumber and put the resulting puree into ice cube trays for freezing. The frozen cubes then go into a freezer bag and will used in future smoothies. Quiche with a handful of sugar snap peas, a few romano beans, a small zucchini, some chopped garlic and eggs, all from our garden. 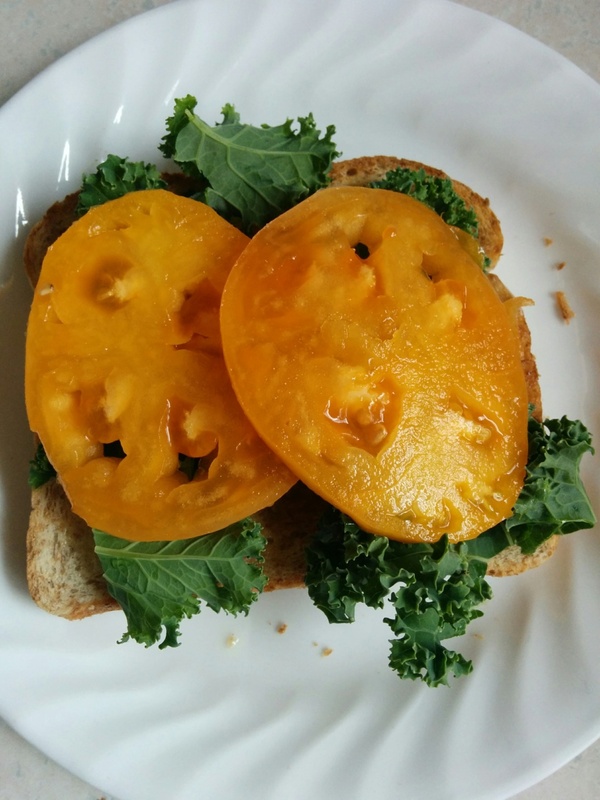 A very simple lunch sandwich using kale and yellow tomato from the SFG. I don't have much imagination when it comes to making meals.